By Piper Peters Aheron, Elaine Johnson Copeland, Ph.D., Cheryl J. McCullough, and Cynthia P. Roddey, D.Min. 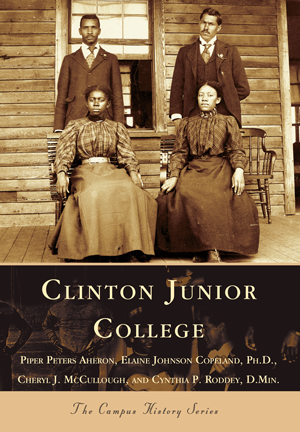 Clinton Junior College was one of many schools established by the African Methodist Episcopal Zion Church during Reconstruction to help eradicate illiteracy among freedmen. The oldest institution of higher education in Rock Hill, South Carolina, it has operated continuously for 110 years. In 1894, Presiding Elder Nero A. Crockett and Rev. W.M. Robinson founded Clinton Institute and named it for Bishop Caleb Isom Clinton, the Palmetto Conference presiding bishop at the time. Incorporated as Clinton Normal and Industrial Institute on June 22, 1909, the school was authorized to grant state teacher certificates. By the late 1940s, the college attracted 225 students per year and owned approximately 19 acres, several buildings, and equipment valued at several million dollars. Under Dr. Sallie V. Moreland, who retired in 1994 after 49 years of stellar service, the school charter was amended to create Clinton Junior College. When Dr. Cynthia L. McCullough Russell assumed leadership, the school prepared for accreditation, attained during the tenure of Dr. Elaine Johnson Copeland. Authors Piper Peters Aheron, Elaine Johnson Copeland, Ph.D., Cheryl J. McCullough, and Cynthia P. Roddey, D.Min., have gathered vintage images and historic documents from yearbooks, archives, and alumni to present this tribute to the heritage and legacy of Clinton Junior College. Aheron is a 6-time Arcadia author; Copeland is the 12th college president; McCullough is the director of development; and Roddey is the director of information services and the library.